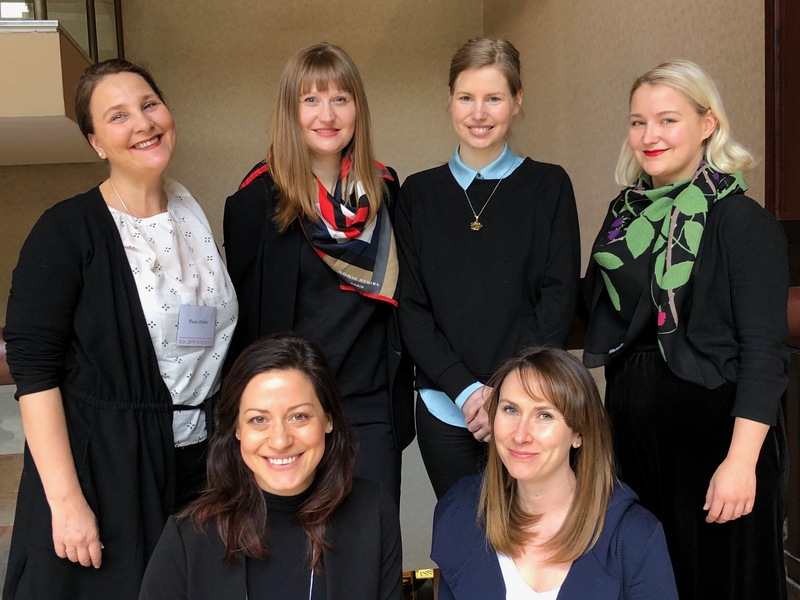 On the 17—19 March 2019, the Refashioning the Renaissance team took part of the the annual Renaissance Society of America conference, this year held in Toronto. 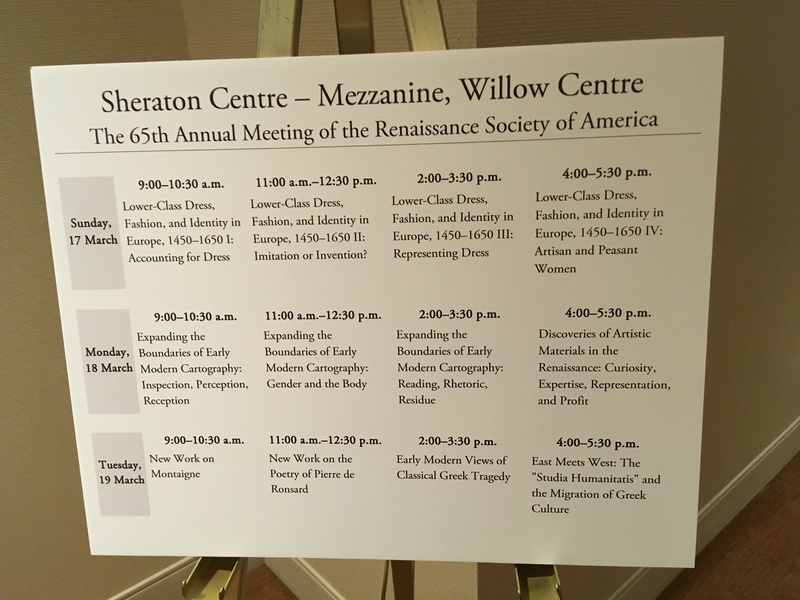 The Refashioning the Renaissance project was very fortunate to get four panel sessions accepted into the conference program, focusing on different aspects of lower-class dress in Europe. 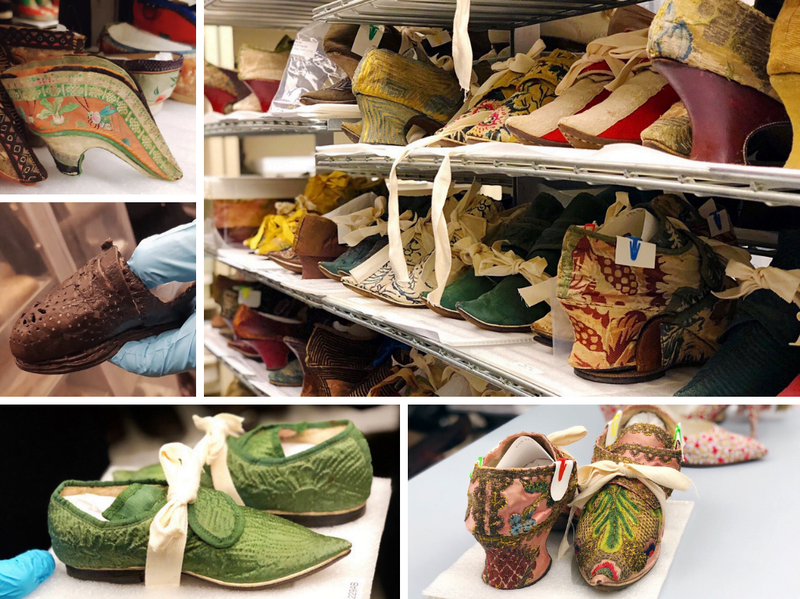 Before the conference, however, we had some time to explore the city of Toronto and some of the fantastic collections of The Bata Shoe Museum, together with Professor Pamela H. Smith, who leads the Making and Knowing Project at Columbia University. 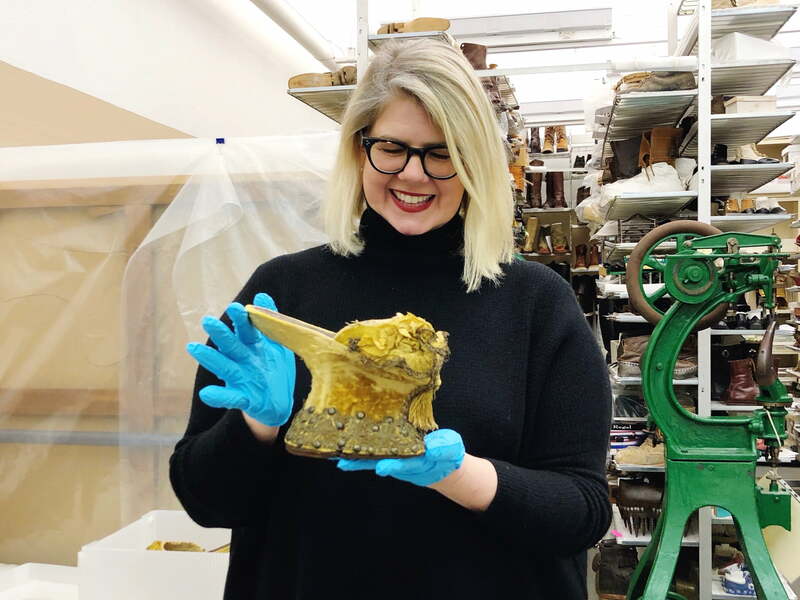 Senior Curator Elizabeth Semmelhack treated us with the behind-the-scenes tour to the museum’s storage, where we had the chance to study some of the amazing shoes they have in their collection. This included beautiful velvet chopines, elaborate 17th century silk slap-sole shoes, a collection of delicately-embroidered Chinese silk shoes for bound feet, early modern everyday leather shoes from Dutch latrines, and extensive collection of Indigenous North American and circumpolar footwear. Getting a close look at these wonderful objects, and a chance to discuss them together with Elizabeth and Pamela was a definite highlight of our time in Toronto! After our visit to the museum, we sat down with Pamela to record a podcast episode for our upcoming series, where we meet interesting scholars and discuss all aspects of research, experiments, and methods. Senior Curator Elizabeth Semmelhack with a Spanish-Italian hybrid style chopines with silver lace, tassels, studs and decorated insoles. 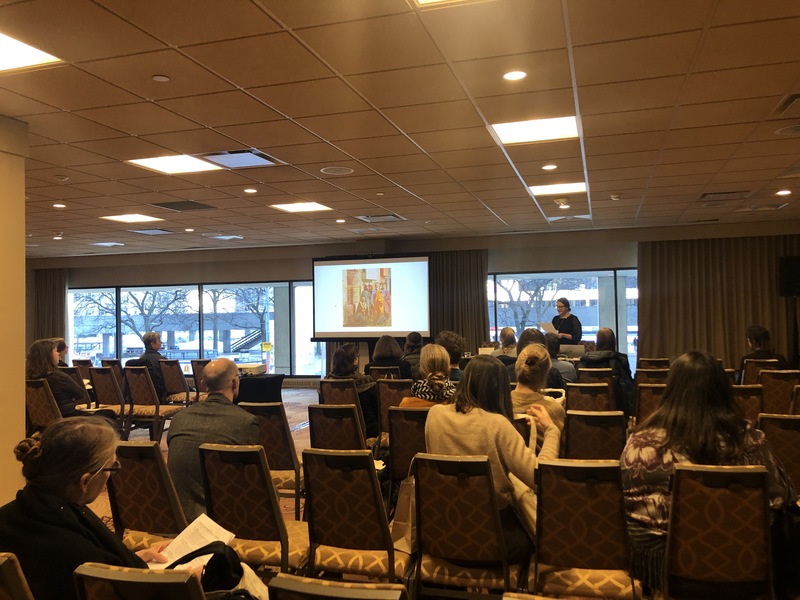 Our four panels on Lower-Class Dress, Fashion and Identity in Europe, 1450–1650 took place on the first day of the conference, and included presentations from all the researchers of the team. Focusing on the Italian context, Paula Hohti presented the Refashioning the Renaissance project, and talked about fashion among artisans in Renaissance Italy, and how artisans were communicating how they wanted to be viewed by others. Stefania Montemezzo added to this by introducing an accounting book by Alessandro Vignarchi, and unspecialised trader who travelled in remote areas in Tuscan Apennines. She discussed the peddlers’ role as intermediaries between areas and markets in the spreading of fashion in especially rural areas in Italy. Furthermore, Michele Nicole Robinson examined cross-cultural exchange of dress and accessories seen in artisan inventories in Siena, Florence and Venice, with a particular focus on pearls. We had a delightful turnout for our panels, and many stayed fro the whole day. Focusing on England and Denmark, Sophie Pitman considered the urban dress among lower social levels of society, especially focusing on the social codes and attitudes towards fashion, as well as imitation materials. Lastly Anne-Kristine Sindvald Larsen discussed the influences of reformation in the dress of Danish artisans. We were also were fortunate that so many scholars wanted to contribute to the discussion of dress of ordinary people, and present in our panels. 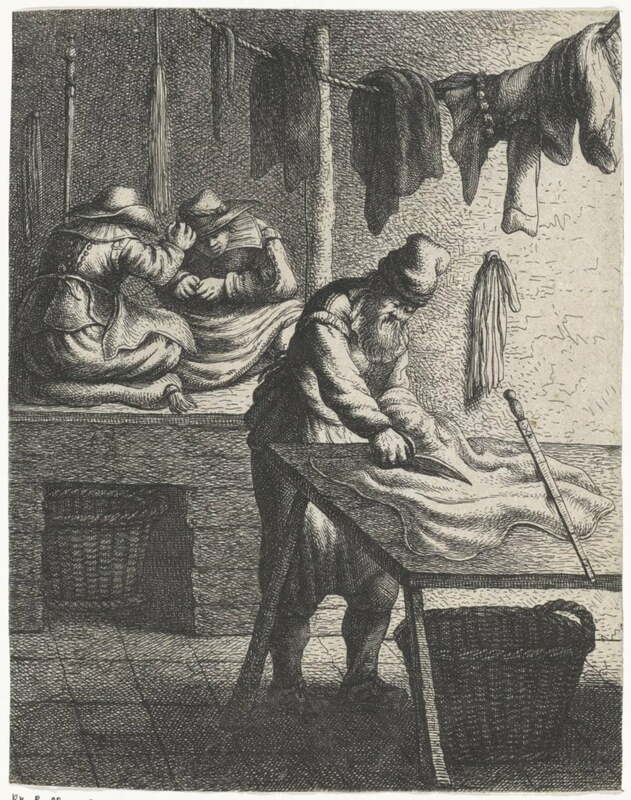 This included scholars such as Joyce de Vries and Amanda Wunder, who focused on the clothing of women seen through Bolognese dowry inventories, and the clothing of the women who were admitted into the poor hospital, Hospital de la Pasión in Madrid, respectively. Francesca Canadé Sautman and Alisa M. Carlson touched on the role of hats and headdresses used by the lower levels of society, by discussing depictions of hats and headwear in the portraits painted by Hans Holbein the Elder in Augsburg, and the depictions of women’s linen head coverings in Europe, with an emphasis on Burgundy-Flanders. Alisa M. Carlson, Francesca Canadé Sautman, Joyce de Vries, and Amanda Wunder. After our own panels were successfully behind us, we were able to enjoy the rest of the conference. Some of our team members had been to previous RSA conferences, whereas for some this was the first time in a conference of this scale. 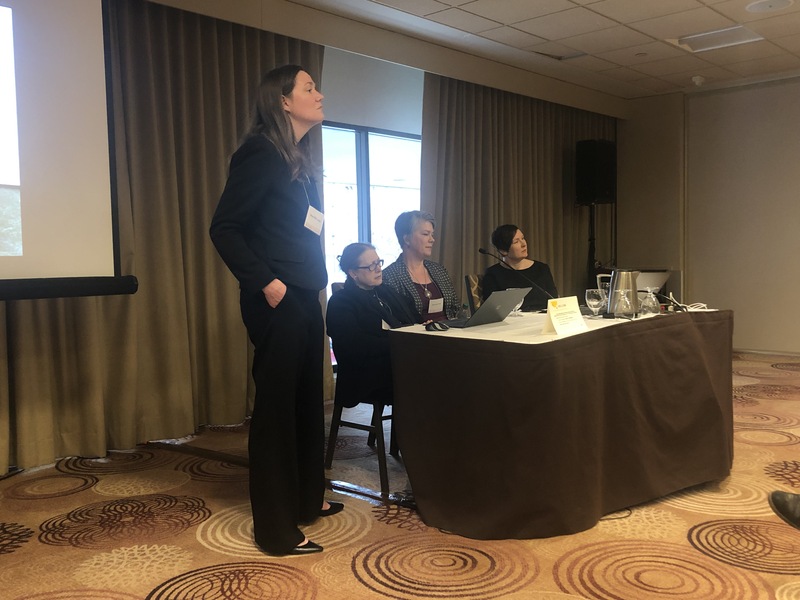 The scope of the presentations and scholars from all areas of Renaissance studies made sure that there were at least three interesting panels going on in any given moment, and it was hard to choose where to go. It was a pleasure to meet some many old and new colleagues, engage in interesting discussions and enjoy the papers that shed light to so many various aspects of renaissance life. We look very much forward to next year´s conference! Sixty is a very important birthday indeed. 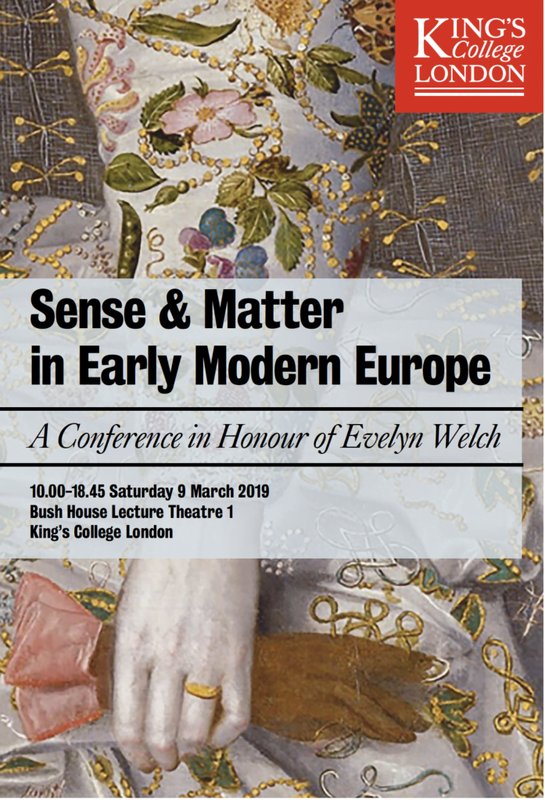 To mark that of Evelyn Welch, Professor of History as well as Provost & Senior Vice President at King’s College, London (not to mention advisory board member for the Refashioning the Renaissance Project), a one-day symposium was held on 9 March 2019. The event, ‘Sense and Matter in Early Modern Europe’, brought together speakers that have worked with Evelyn over the course of her career. The day was divided into three parts: Fashion and Textiles, Consumption and Body and Medicine, highlighting some of Evelyn’s primary research interests over the years. There was also a great round of lightning talks by early career researchers, intended to reflect Evelyn’s longstanding role as mentor to those at the start of their academic journeys. Paula Hohti, Refashioning the Renaissance’s principal investigator, was one of the speakers featured in the session on consumption, where she presented her paper, ‘Did ordinary Italians have a ‘Renaissance’?’ Paula was able to draw on both past and current research to show that working people in Siena owned objects and garments usually associated with the wealthy and elite. 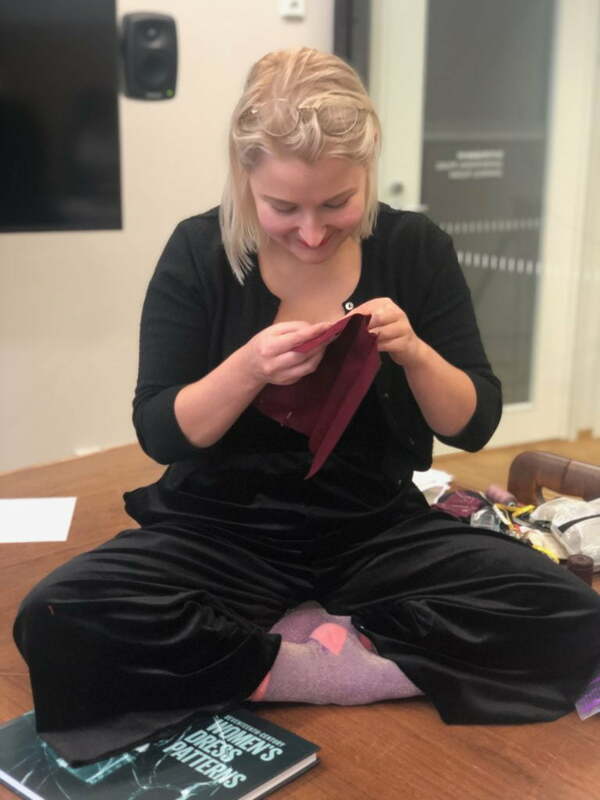 She was also able to highlight the important contributions of members of the public, who are knitting silk and wool stockings for our project based on historic patterns and examples as part of the Citizen Science Project. Bruno Blondé and James Shaw also spoke on this panel; Blondé demonstrated the critical role of cultural value in shifting patterns of consumption, particularly around silver in the Low Countries, while Shaw suggested the complexities of valuing goods and arriving at final prices, which sometimes resulted in financial ‘lesions’. 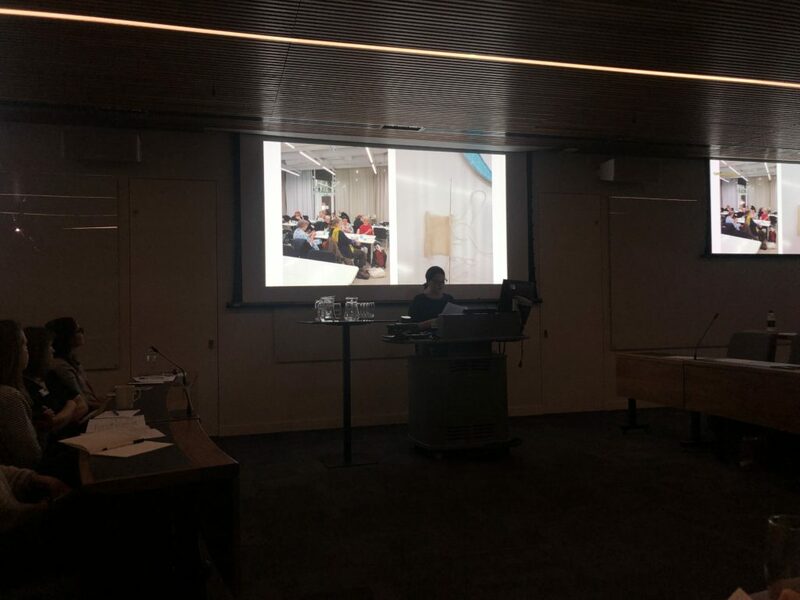 Attendees were also treated to presentations on the history of dress and fashion by Ulinka Rublack, Maria Hayward and Lesley Miller, which highlighted the power of dress objects to represent social stresses (and even cause riots!) and to help wearers curry favour with prospective patrons. We also learned the incredible value of reconstruction as a research method and the importance of failure in such experiments. This is particularly important advice for the Refashioning the Renaissance team as we move deeper into the experimental phase of the project. Jenny Tiramani and Ulinka Rublack with the reconstruction of a costume owned by Matthäus Schwarz. Photo © Graham CopeKoga. The day was rounded out with a series of lightning talks by early career researchers Rose Byfleet, Abigail Gomulkiewicz, Anna Parker and Annie Thwaite, and presentations on the theme of Body and Medicine by Tessa Storey and Hannah Murphy, which encompasses Evelyn’s current area of research, Renaissance Skin. Finally, John Styles offered closing remarks that brought all of the sessions and papers together. In addition to the fascinating research presented by all the speakers at this symposium, ‘Sense and Matter’ also demonstrated how critical collaborative funding is to the humanities – and the long-lasting results it can have; many participants in Evelyn Welch and Michelle O’Malley’s ‘The Material Renaissance’ project were present to share new research, support colleagues and celebrate a dear friend’s birthday. Happy birthday Evelyn! What skills did artisans use to achieve Renaissance fashions? How can historians learn and study with their hands? These questions are on our minds as we launch the experimental phase of the Refashioning the Renaissance Project. For our first foray into hands-on making as a team we decided to get to grips with tailoring, and so we invited Melanie Braun, Head of Wardrobe at the Nationale Reisopera, Enschende, Netherlands and teacher at the School of Historical Dress, London to Aalto University to lead an intensive two-day workshop introducing us to early modern tailoring techniques. 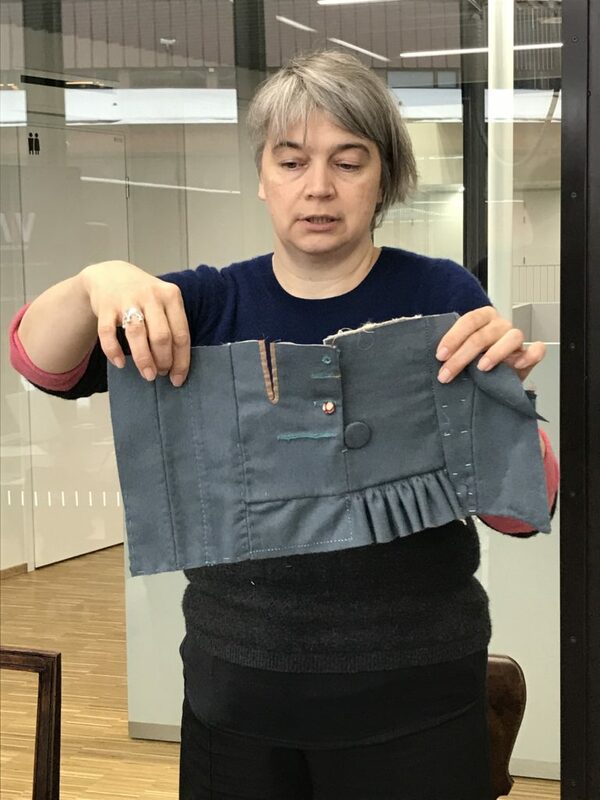 Melanie is a trained tailor whose skills were honed during an apprenticeship at the Staatstheater Braunschweig, and many years working in theatre companies, including at Shakespeare’s Globe. Along with the rest of the team at the School of Historical Dress, she has closely examined dozens of surviving early modern objects in museum collections and has created patterns and reconstructions of many sixteenth- and seventeenth-century garments. 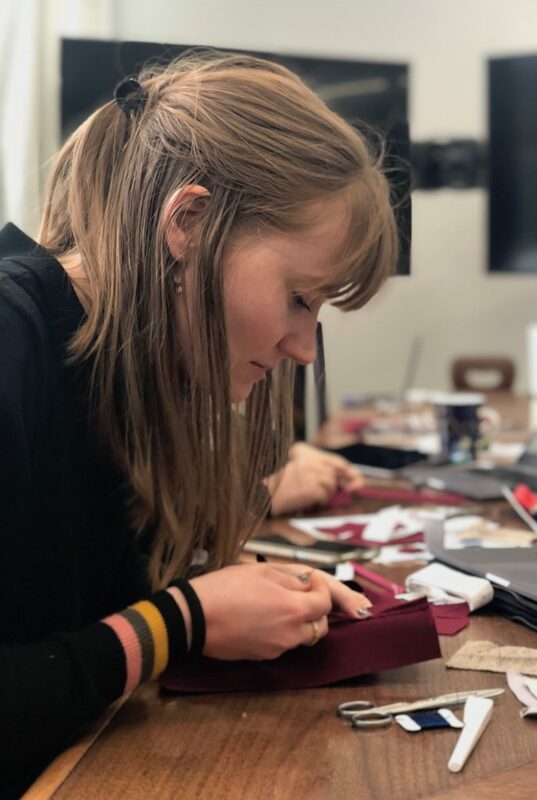 Our workshop focused on both the range of stitches and materials used by the tailor, and the geometrical pattern drafting that enabled the creation of the distinctive shapes of renaissance clothing. Melanie Braun holds up a sampler showing early modern tailoring techniques. We set out to create a small sampler which enabled us to try out the types of stitches, linings and techniques that tailors used. First we began with running stitch, a stabbing in and out action that many of us were familiar with from school needlework lessons. But once we started exploring a range of possible stitches – back stitch, half-back stitch, felling stitch – we realised how these techniques required different amounts of thread, took varied amounts of time and concentration, and provided a range of strengths and visual effects. Sophie Pitman concentrates on making an even stitch. Even seemingly simple tasks, like repeatedly threading a small needle or being able to create a balanced and neat stitch could be challenging to us as amateurs. 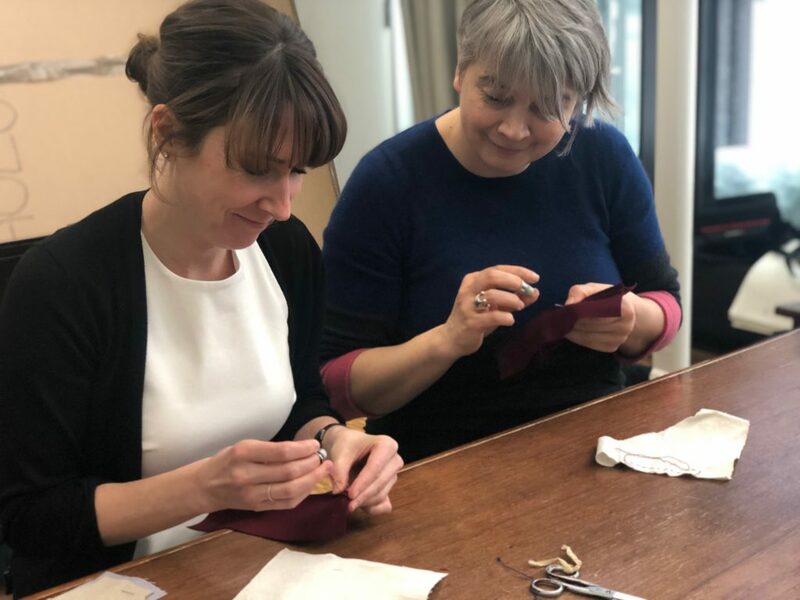 Seeing how quickly Melanie could create a knot with one hand or judge just the right amount of thread to use, demonstrated the value of years of experience, something that twenty-first-century and sixteenth-century tailors alike acquire over years of apprenticeship. Melanie showing Michele Robinson how to work with a thimble. Using wool and short staple unspun cotton, we experimented with quilting, which tailors often sewed into the linings of a garment to provide shape, warmth and even protection. Structure could also be added with pad stitches, diagonal stitches done in v-shaped rows that give collars, bellypieces, tabs and shoulders added volume and curves. Tailors also sat on the table in order to use their bodies to shape the fabric. Piia Lempiänen works sitting on the table, just as tailors did in the seventeenth century. We also tried drafting pattern shapes with a compass. While we do not know exactly how tailors measured their clients and then drafted patterns for them which ensured a flattering and fashionable fit, a close examination of surviving garments suggests that early modern tailors were true geometers, using proportion and curves to create elegant and balanced shapes. 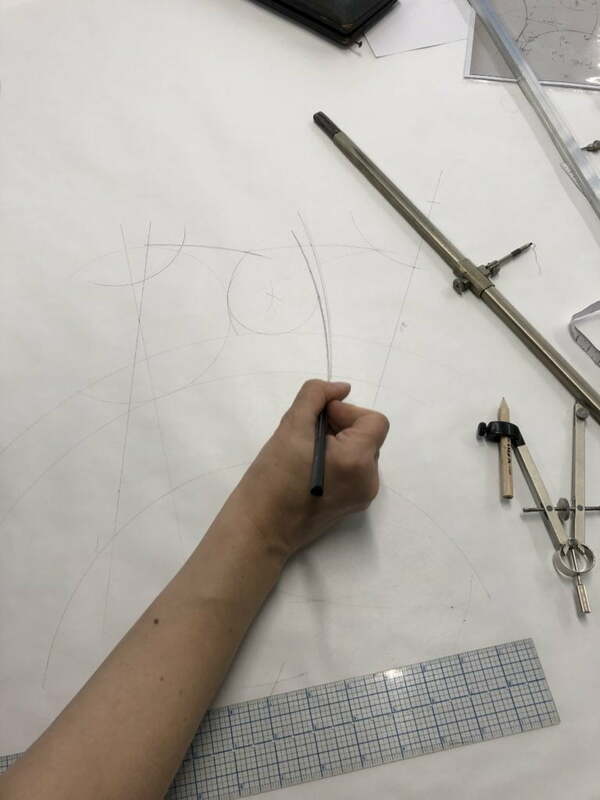 Watching Melanie expertly draft a pattern, combining her trained eye for shape and her knowledge of well-proportioned measurements, demonstrated how the tailor had to know mathematically and practically how to transform two-dimensional materials into three-dimensions. Geometrical pattern drafting of a doublet front. Hands-on experimentation revealed how actually trying the various steps in the making process can raise many questions about early modern material culture – how, for example, did tailors measure their clients, where did they source their lining materials, how strong were the smallest needles in the sixteenth century, and did tailors feel anxious when cutting valuable materials? Working with skilled makers helps us to ask better questions and fill in gaps where no archival, visual, or material records survive, and it also helps us better understand extant sources. By working with our hands, we are also training our eyes. When looking closely at garments in museums that contain some of the techniques we struggled with, we can better appreciate the tailor’s highly skilled work. Not only did these two days enable us to experience some of the techniques used by skilled artisans, but the workshop was also an opportunity for us to learn how best to document our experiments with field notes, photographs, and films. Over the coming months, we will continue to share our experiences with hands-on experimentation. Janet Arnold, Patterns of Fashion 3: The cut and construction of clothes for men and women c. 1560-1620, Macmillan, 1985. Melanie Braun, Luca Costigliolo, Susan North, Claire Thornton & Jenny Tiramani, 17th Century Men’s Dress Patterns 1600–1630, Thames & Hudson & V&A, 2016. 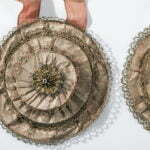 Updates on the work we are doing and small tidbits on early modern dress research. How can we gain access to the hidden meanings and complexities that lie behind historical objects and documents? Did Dress and Fashion Matter in the Poor Neighbourhoods?